You know what’s fun? Goal setting. No, really – bear with me for a second. You know how you get all excited in January to do your resolution? You know those fun little color coded spreadsheets you make for yourself, with benchmarks and rewards and motivational quotes? Well, some of us do that. But I’m betting you can join me in relating to just about now, when we’ve pretty much abandoned our resolutions by the wayside. Seeing a goal through is a rewarding experience, and – frankly – we could all use a little motivation and encouragement. And a nifty gimmick with interesting historical roots. 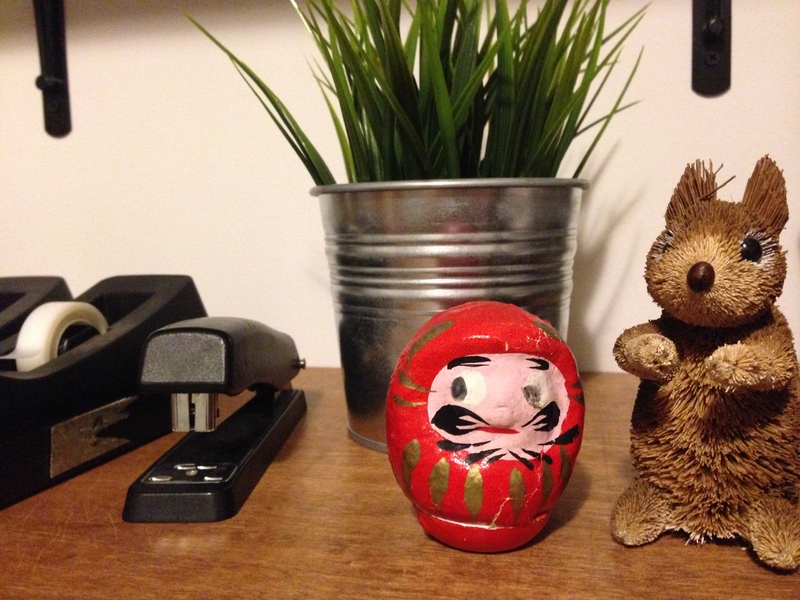 So let me introduce you to the Daruma Doll. We have Beret to thank for bringing this little guy into my life, when she gave me one for my birthday … egads, almost fifteen years ago. These papier-mâché Japanese dolls are good luck and goal setting charms, modeled after Bodhidharma, the Buddhist monk credited with bringing Zen Buddhism to China. Bodhidharma, according to Google Image Search. Decide upon a goal. Focus on the outcome as you hold your Daruma Doll. Color in one of the Daruma Doll’s eyes. This signifies your commitment to your goal. Place the Doll somewhere you will see it every day, reminding you of your commitment to your goal. Once you have achieved your goal, color in the remaining eye. Why yes, I met my goal. Now he lives next to Mr. Squirrel on a shelf above my desk. So how could you use this with your kiddos? Thanks to the magic of the internet, you can purchase one from Amazon. (Is there anything you can’t get from Amazon? Anyone else wish they had invested in this way back when?) Alternately, you could design one yourself on paper, or – should you be feeling super crafty – papier-mâché or clay sculpt your own. Talking about what constitutes a realistic goal is a good conversation to have with young’uns. What’s concrete and do-able? How will you know you’ve reached your goal? Maybe start small and work your way up to something more long term. Having these conversations early is a great way to help your kids in getting started to think realistically about setting benchmarks and making reasonable resolutions. This is a great follow up to a parent/teacher conference as well – planning a goal for improvement and setting realistic strategies and outcomes. And hey, while we’re at it, what reward do we want once we’ve achieved our goal? This is a great opportunity to acknowledge that we totally deserve rewards for our efforts while reinforcing that said reward does not have to – nor should it – be a trip to Disneyland. Free reign in choosing the dinner menu, perhaps (one unbalanced meal isn’t going to kill anyone). A bonus chapter at read aloud. Your commitment to playing that tedious game she loves and is always begging you to join. Making cookies together. This is your chance to get creative with rewards that don’t involve consumerism or enormity. Think too: why not make this a full family activity? Everyone can set a goal and encourage each other to success. It never hurts us, as adults, to have a reminder to set realistic expectations for ourselves – and to think about the rewards we want when we’ve made it happen. 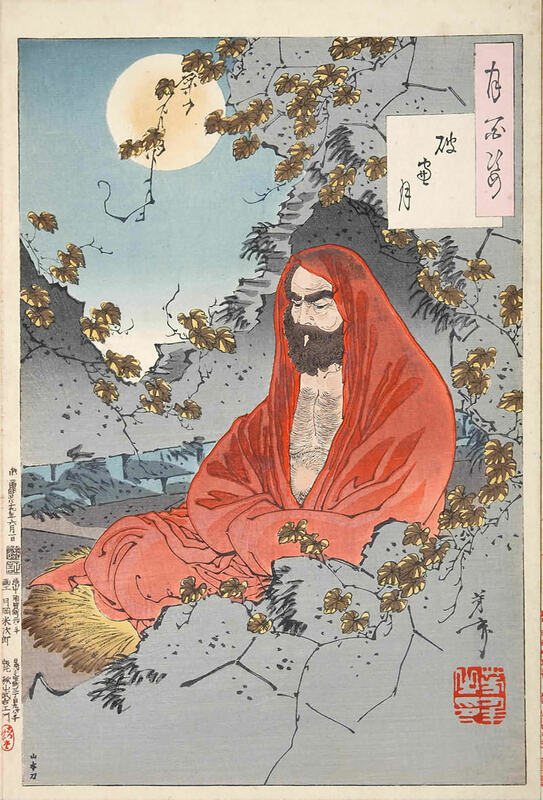 Stories abound about Bodhidharma. For one version, check out this site from the Shaolin Temple of the US. Also consider: visiting a Buddhist temple or center in your area. Several in both the Bay Area and New York have regular community events and festivals. I love this! Although I loved it even more when I misread the title as Drauma doll. Dolls to act out my daily dramas! I need ten! I think when I was a kid Barbies served as my Drauma dolls. My sister and I had a particularly memorable afternoon when Dallas the horse broke her leg and had to be shot.